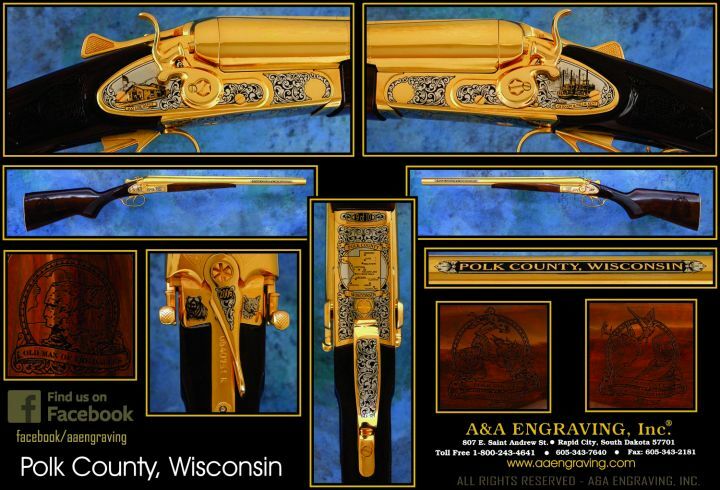 Wisconsin* | Regional | Inventory | A&A Engraving, Inc.
Commemorative Firearms honoring the great state of Wisconsin. 5/10 is available for purchase. The humble birthplace of the Republican party is found right in Fond du Lac county. Only one rifle remains before this edition is retired forever. Includes: Original EMF box w/paperwork, numbered & signed Certificate of Authenticity, Vanguard French-fit case. #5/10 is available for purchase. #10/10 is available for purchase. 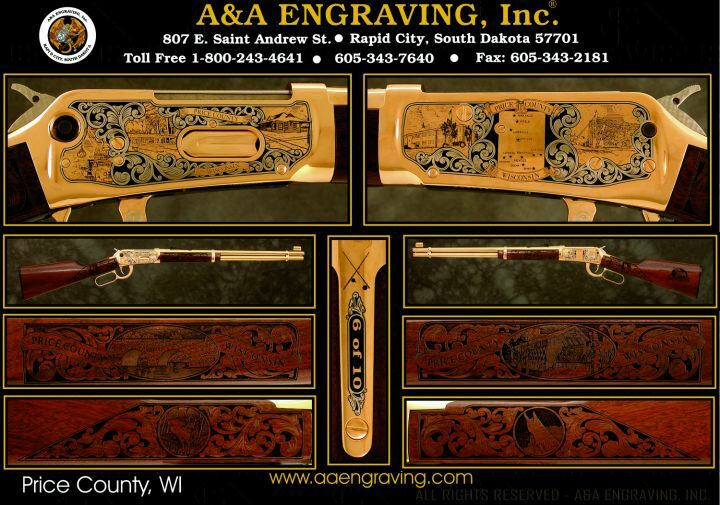 Finish: 5-tone Deluxe 24K gold finish, gold barrel, hand-finished high gloss hardwood stock with laser engraved stock and forend. Individually numbered. Includes: French-fit Vanguard case, original EMF box with paperwork, numbered & signed Certificate of Authenticity. #1/10 is available for purchase. Finish: 5-tone Deluxe 24K gold finish, gold barrels, hand-finished high gloss American Walnut stock with laser engraving. Individually numbered. 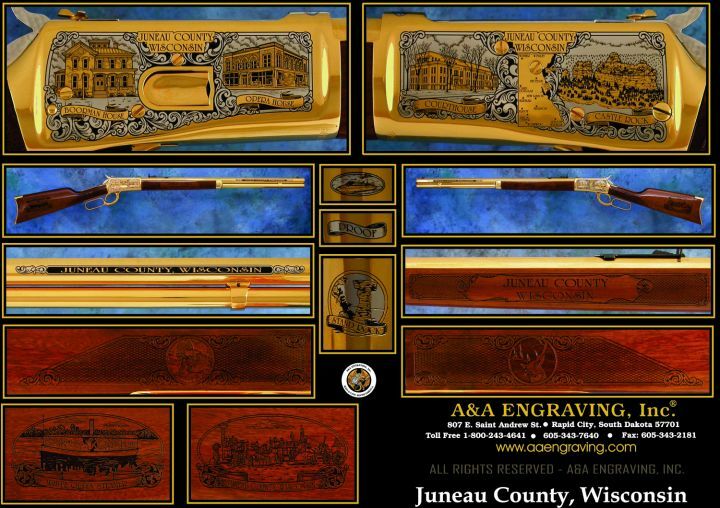 Includes: Handmade Oak Display Case, original Remington box with paperwork, numbered & signed Certificate of Authenticity. #6/10 is available for purchase. 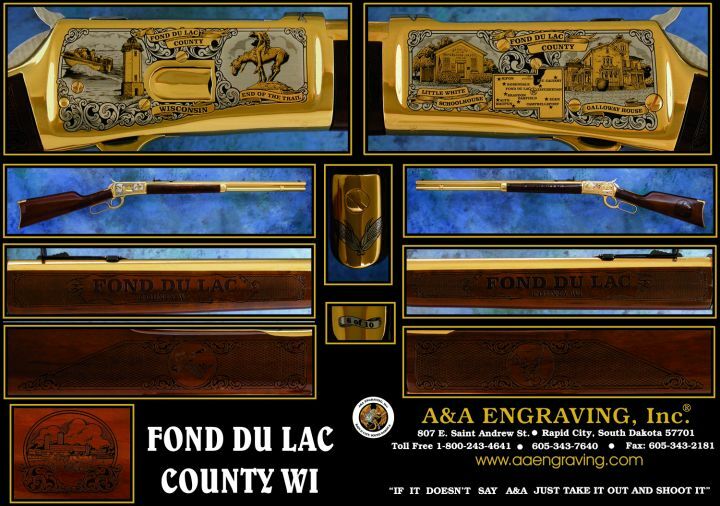 Includes: French-fit Vanguard case, original Winchester box with paperwork, numbered & signed Certificate of Authenticity.